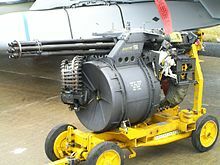 The M61 Vulcan is a hydraulically, electrically or pneumatically driven, six-barrel, air-cooled, electrically fired Gatling-style rotary cannon which fires 20 mm rounds at an extremely high rate (typically 6,000 rounds per minute). The M61 and its derivatives have been the principal cannon armament of United States military fixed-wing aircraft for fifty years. The M61 was originally produced by General Electric. After several mergers and acquisitions, it is currently produced by General Dynamics. At the end of World War II, the United States Army Air Forces began to consider new directions for future military aircraft guns. The higher speeds of jet-powered fighter aircraft meant that achieving an effective number of hits would be extremely difficult without a much higher volume of fire. While captured German designs (principally the Mauser MG 213C) showed the potential of the single-barrel revolver cannon, the practical rate of fire of such a design was still limited by ammunition feed and barrel wear concerns. The Army wanted something better, combining extremely high rate of fire with exceptional reliability. In 1947, the Air Force became a separate branch of the military. The new Air Force made a request for a new aircraft gun. A lesson of World War II air combat was that German, Italian, and Japanese fighters could attack American aircraft from long range with their cannon main armament. American fighters with .50 cal main armament, such as the P-51 and P-47, had to be close to the enemy in order to hit and damage enemy aircraft. The 20mm Hispano cannon carried by the P-38 and P-61, while formidable against propeller-driven planes, had a relatively low rate of fire in the age of jets, while other cannons were notoriously unreliable. 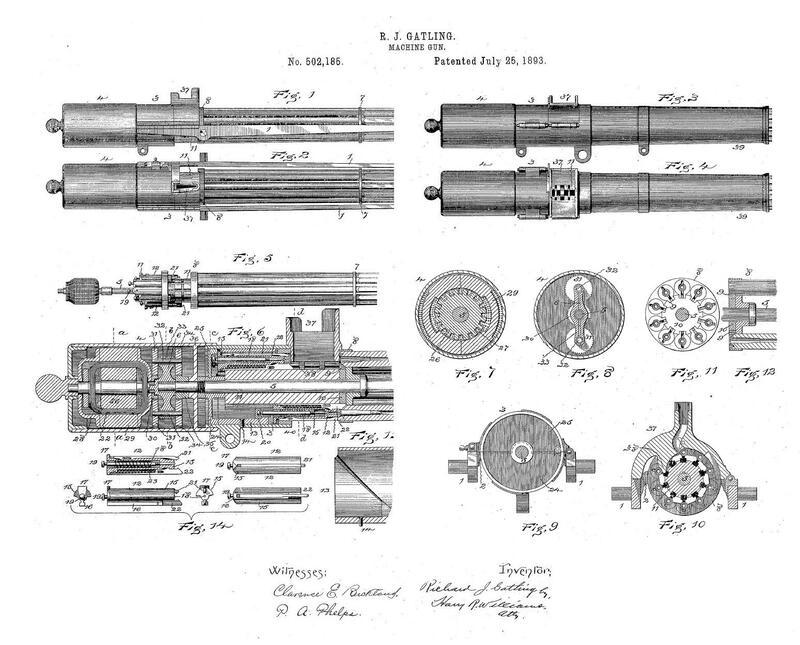 In response to this requirement, the Armament Division of General Electric resurrected an old idea: the multi-barrel Gatling gun. 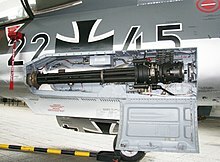 The original Gatling gun had fallen out of favor because of the need for an external power source to rotate the barrel assembly, but the new generation of turbojet-powered fighters offered sufficient electric power to operate the gun, and electric operation was more reliable than gas-operated reloading. With multiple barrels, the rate of fire per barrel could be lower than a single-barrel revolver cannon while providing a greater overall rate of fire. The idea of powering a Gatling gun from an external electric power source was not a novel idea at the end of World War II, as Richard Jordan Gatling himself had done just that with a patent he filed in 1893, with the similar, but powered either by the aircraft engine or an electric motor, 12-barreled Fokker-Leimberger aircraft rotary machine gun under development during World War I by the German Empire. In 1946, the Army issued General Electric a contract for "Project Vulcan", a six-barrel weapon capable of firing 7,200 rounds per minute (rpm). Although European designers were moving towards heavier 30 mm weapons for better hitting power, the U.S. initially concentrated on a powerful 0.60-inch (15 mm) cartridge designed for a pre-war anti-tank rifle, expecting that the cartridge's high muzzle velocity would be beneficial for improving hit ratios on high speed targets. The first GE prototypes of the 0.60-inch (15 mm) caliber T45 were ground-fired in 1949; it achieved 2,500 rpm, which was increased to 4,000 rpm by 1950. By the early 1950s, the USAF decided that high velocity alone might not be sufficient to ensure target destruction and tested 20 mm and 27 mm alternatives based on the 0.60-inch (15 mm) caliber cartridge. These variants of the T45 were known as the T171 and T150 respectively, and were first tested in 1952. Eventually, the standard 20×102 mm cartridge was determined to have the desired balance of projectile/explosive mass and muzzle velocity, resulting in an optimum balance of range, accuracy and kinetic energy on target. The development of the Lockheed F-104 Starfighter revealed that the T171 Vulcan (later redesignated M61) suffered problems with its linked ammunition, being prone to misfeed and presenting a foreign object damage (FOD) hazard with discarded links. A linkless ammunition feed system was developed for the upgraded M61A1, which subsequently became the standard cannon armament of U.S. fighters. In 1993, General Electric sold its aerospace division, including GE Armament Systems along with the design and production tooling for the M61 and GE's other rotary cannon, to Martin Marietta. After Martin's merger with Lockheed, the rotary cannon became the responsibility of Lockheed Martin Armament Systems. Lockheed Martin Armament Systems was later acquired by General Dynamics, who currently produce the M61 and its variants. An M61 Vulcan and the feed system for an F/A-18, on a stand. Each of the cannon's six barrels fires once in turn during each revolution of the barrel cluster. The multiple barrels provide both a very high rate of fire—around 100 rounds per second—and contribute to prolonged weapon life by minimizing barrel erosion and heat generation. Mean time between jams or failures is in excess of 10,000 rounds, making it an extremely reliable weapon. 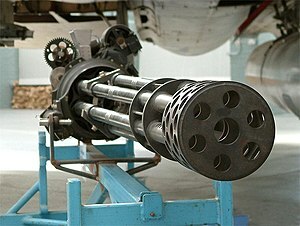 The success of the Vulcan Project and its subsequent progeny, the very-high-speed Gatling gun, has led to guns of the same configuration being referred to as "Vulcan cannon", which can sometimes confuse nomenclature on the subject. Most aircraft versions of the M61 are hydraulically driven and electrically primed. The gun rotor, barrel assembly and ammunition feed system are rotated by a hydraulic drive motor through a system of flexible drive shafts. The round is fired by an electric priming system where an electric current from a firing lead passes through the firing pin to the primer as each round is rotated into the firing position. The self-powered version, the GAU-4 (called M130 in Army service), is gas-operated, tapping gun gas from three of the six barrels to operate the gun gas driven mechanism. The self-powered Vulcan weighs about 10 pounds (4.5 kg) more than its electric counterpart, but requires no external power source to operate, except for an electric, inertia starter to initiate gun rotation, allowing the first rounds to be chambered and fired. The initial M61 used linked, belted ammunition, but the ejection of spent links created considerable (and ultimately insuperable) problems. The original weapon was soon replaced by the M61A1, with a linkless feed system. Depending on the application, the feed system can be either single-ended (ejecting spent cases and unfired rounds) or double-ended (returning casings back to the magazine). A disadvantage of the M61 is that the bulk of the weapon, its feed system, and ammunition drum makes it difficult to fit it into a densely packed airframe. The feed system must be custom-designed for each application, adding 300–400 lb (140–180 kg) to the complete weapon. Most aircraft installations are double-ended, because the ejection of empty cartridges can cause a foreign-object damage (FOD) hazard for jet engines and because the retention of spent cases assists in maintaining the center of gravity of the aircraft. The first aircraft to carry the M61A1 was the C model of the F-104, starting in 1959. A lighter version of the Vulcan developed for use on the F-22 Raptor, designated M61A2, is mechanically the same as the M61A1, but with thinner barrels to reduce overall weight to 202 pounds (92 kg). The rotor and housing have also been modified to remove any piece of metal not absolutely needed for operation and replaces some metal components with lighter weight materials. The F/A-18E/F Super Hornet also uses this version. The Vulcan's rate of fire is typically 6,000 rounds per minute, although some versions (such as that of the AMX and the F-106 Delta Dart) are limited to a lower rate, and others (A-7 Corsair) have a selectable rate of fire of either 4,000 or 6,000 rounds per minute. The M61A2's lighter barrels allow a somewhat higher rate of fire, up to 6,600 rounds per minute. An M61 Vulcan at the Miramar Airshow. PGU-27 AB training rounds, Brussels 2015. Practically no powered rotary cannon is supplied with sufficient ammunition for a full minute of firing, due to its weight (at 6,000 rpm, the projectiles alone would represent a mass of about 600 kg (1,320 lb) for 1 minute firing; and by including the brass shell, filling and primer the weight is slightly double that at 1225 kg (2,700 lb)). In order to avoid using the 600-1000 rounds carried by aircraft all at once, a burst controller is generally used to limit the number of rounds fired at each trigger pull. Bursts of from two or three up to 40 or 50 can be selected. The size of the airframe and available internal space limits the size of the ammunition drum and thus limits the ammunition capacity. When vehicle mounted the only limiting factor is the vehicles safe carry weight, so commensurately larger ammo storage is available. Until the late 1980s, the M61 primarily used the M50 series of ammunition in various types, typically firing a 3.5 ounces (99 g) projectile at a muzzle velocity of about 3,380 feet per second (1,030 m/s). A variety of Armor-Piercing Incendiary (API), High Explosive Incendiary (HEI), and training rounds are available. The M246 HEI-T-SD (High-Explosive Incendiary, Tracer, Self-Destroying) is the primary round for use against aerial targets. The new PGU-28/B round was developed in the mid-1980s. It is a semi-armor-piercing high-explosive incendiary (SAPHEI) round, providing improvements in range, accuracy, and power over the preceding M56A3 HEI round. PGU-28/B is a "low-drag" round designed to reduce in-flight drag and deceleration, and has a slightly increased muzzle velocity of 3,450 feet per second (1,050 m/s). However, the PGU-28/B has not been without problems. A 2000 USAF safety report noted 24 premature detonation mishaps (causing serious damage in many cases) in 12 years with the SAPHEI round, compared to only two such mishaps in the entire recorded history of the M56 round. The report estimated that the current PGU-28/B had a potential failure rate 80 times higher than USAF standards permit. Due to safety issues, it was limited to emergency wartime use in 2000. The main types of combat rounds and their main characteristics are listed in the table below. M53 API ? 65 gr (4.2 g; 0.15 oz) incendiary 1030 6.4 mm (0.25 in) RHA penetration at 0 degree impact angle and 1,000 m (3,300 ft) range. M56A3/A4 HEI 1,543 gr (100.0 g; 3.5 oz) 165 gr (10.7 g; 0.38 oz) HE and 20 gr (1.3 g; 0.046 oz) incendiary 1030 Nose fuzed round, no tracer. 2 m (6.6 ft) effective radius to produce casualties to exposed personnel. Fragmentation hazard out to 20 m (66 ft). 12.7 mm (0.50 in) RHA penetration at 0 degree obliquity at 104 m (341 ft) range. PGU-28A/B SAPHEI 1,580 gr (102.4 g; 3.6 oz) 150 gr; 0.35 oz (10 g) 1050 Multi-purpose fuzeless round with an incendiary charge in the nose setting off the HE behind it with a slight delay to maximize lethality against aircraft. No tracer or self-destruct. A zirconium pellet at the bottom of the HE cavity provides additional incendiary effect. The Vulcan first entered aerial combat on 4 April 1965 when four North Vietnamese Air Force MiG-17s (J-5s) attacked a force of 10 escorting North American F-100 Super Sabres (2 of which were assigned weather reconnaissance duties) and 48 Vulcan-armed and "bomb-laden" F-105 Thunderchiefs, shooting down two of the latter. The MiG Leader, Capt. Tran Hanh, and the only survivor from the four MiGs, reported that U.S. jets had pursued them and that F-105s had shot down three of his aircraft, killing Lieutenants Pham Giay, Le Minh Huan, and Tran Nguyen Nam. Capt. Donald Kilgus piloting an F-100 received an official probable kill with his four M39 20 mm cannons during the engagement; however no other US pilot reported destroying any MiGs during the battle, leaving open the plausibility that at least two of the MiG-17s may have been downed by their own anti-aircraft fire. The first confirmed Vulcan gun kill occurred on 29 June 1966 when Major Fred Tracy, flying his F-105 Thunderchief with the 421st TFS, fired 200 rounds of 20mm into a MiG-17 that had just fired a 23mm shell through one side of his cockpit and which exited out the other side. When the NVAF MiG flew in front of him after making his pass, Maj. Tracy opened fire on him. The gun was installed in the Air Force's A-7D version of the LTV A-7 Corsair II where it replaced the earlier United States Navy A-7's Colt Mk 12 cannon and was adopted by the Navy on the A-7C and A-7E. It was integrated into the newer F-4E Phantom II variants. The F-4 was originally designed without a cannon as it was believed that missiles had made guns obsolete. Combat experience in Vietnam showed that a gun could be more effective than guided missiles in many combat situations and that an externally carried gun pod was less effective than an internal gun; the first generation of gun pods such as the SUU-16 were not oriented with the sights of the fighter. The improved pods were self-powered and properly synchronized to the sights. The next generation of fighters built post-Vietnam incorporated the M61 gun internally. 1972 F-4E M61A1 (3) MiG-21s 35th TFS; The F4E was the first Phantom II to enter the war with an internal Vulcan gun. The Vulcan was later fitted into the weapons bay of some Convair F-106 Delta Dart and General Dynamics F-111 Aardvark models. It was also adopted as standard in the "teen"-series air superiority fighters, the Grumman F-14 Tomcat, the McDonnell Douglas F-15 Eagle, General Dynamics F-16 Fighting Falcon and McDonnell Douglas F/A-18 Hornet. Other aircraft include the Italian/Brazilian AMX International AMX (on Italian aircraft only), and the F-22 Raptor. It was fitted in a side-firing installation on the Fairchild AC-119 and some marks of the Lockheed AC-130 gunships, and was used in the tail turrets of both the Convair B-58 Hustler and Boeing B-52H Stratofortress bombers. Japan's Mitsubishi F-1 carried one internally mounted JM61A1 Vulcan with 750 rounds. Two gun pod versions, the SUU-16/A (also designated M12 by the US Army) and improved SUU-23/A (US Army M25), were developed in the 1960s, often used on gunless versions of the F-4. The SUU-16/A uses the electric M61A1 with a ram-air turbine to power the motor. This proved to cause serious aerodynamic drag at higher speeds, while speeds under 400 miles per hour (640 km/h) did not provide enough airflow for the maximum rate of fire. The subsequent SUU-23/A uses the GAU-4/A self-powered Vulcan, with an electric inertia starter to bring it up to speed. Both pods ejected empty cases and unfired rounds rather than retaining them. Both pods contained 1,200 rounds of ammunition, with a loaded weight of 1,615 and 1,720 pounds (733 and 780 kg) respectively. During service in the Vietnam War, the pods proved to be relatively inaccurate: the pylon mounting was not rigid enough to prevent deflection when firing, and repeated use would misalign the pod on its pylon, making matters worse. A variant with much shorter barrels, designated the M195, was also developed for use on the M35 Armament Subsystem for use on the AH-1G Cobra helicopter. This variant fed from ammunition boxes fitted to the landing skid and was developed to provide the AH-1 helicopter with a longer-range suppressive fire system before the adoption of the M97 Universal Turret mounting the M197 cannon. The M61 mounted on a US Army M163 armored vehicle. The M61 is also the basis of the US Navy Mk 15 Phalanx Close-in weapon system and the M163 VADS Vulcan Air Defense System, using the M168 variant. ^ a b c "M61 20mm cannon". Federation of American Scientists. 23 April 2000. Retrieved 2009-02-28. ^ "Elec key Gatling" (JPEG) (image). US: Image shack. .
^ Wahl, Paul F; Toppel, Donald R (5 Oct 2005) [Arco Publishing Company, New York, NY, 1965]. "The Gatling Gun". Aircraft Armament & Small Arms Product Support Integration Directorate. Archived from the original on 2008-09-21. Retrieved 2008-09-28. ^ "PEO Ammunition Systems" (PDF). dau.mil. ^ "M61A1 GAU 4 20-MM Vulcan Cannon". Retrieved 12 July 2017. ^ "GAU-4 20mm Vulcan M61A1/M61A2 20mm Automatic Gun". Federation of American Scientists. Retrieved 4 January 2018. ^ "Aviation Unit Maintenance Manual for 20-mm Automatic Gun". Headquarters, Department of the Army, 1986. Chapter 5, sections 1-2. ^ a b "PGU-27A/B TP/PGU-28A/B SAPHEI/ GU-30A/B TP-T". GlobalSecurity.org. Retrieved 2008-09-28. ^ "PGU-28/B Premature Detonation in Barrel/Barrel Damage". Ammunition Active (PDF) (Report). Airborne Weapons Corrective Action Program. 30 November 2001. pp. 1–6. 14597. Archived from the original (PDF) on 17 October 2004. ^ "Jane's International Defense Review: IDR, Volume 36, Issues 1-6". Jane's Information Group, 2003. "In 2000, the newer-technology PGU-28/B ammunition for the M61 was restricted to emergency wartime use after a series of mishaps." ^ a b c d e f "20-Millimeter". Air cav. 12 January 2008. ^ a b "ORDATA: Ordnance Identification Tool". JMU. Archived from the original on 28 August 2008. ^ a b Chant, Christopher (1987). A Compendium of Armaments and Military Hardware. Routledge. pp. 65–70, 106, 114–15, 341–43, 363, 389, 404–5. ISBN 978-0-7102-0720-3. ^ McCarthy Jr. pp. 148–57. Excludes combination air-to-air missile/gun kills. Anderton, David A. North American F-100 Super Sabre. Osprey Publishing, 1987. ISBN 978-0-85045-662-2. Campbell, John M. and Hill, Michael. Roll Call: Thud; A Photographic Record of the F-105 Thunderchief. 1996, Schiffer Publishing. ISBN 0-7643-0062-8. Davies, Peter E. U.S. Air Force F-4 Phantom II MiG Killers 1965–68. Osprey Combat Aircraft #45, 2004, Osprey Publishing, UK. ISBN 1-84176-656-9. Davies, Peter E. USAF F-4 Phantom II MiG Killers 1972–73. Osprey Combat Aircraft 55 (2005). ISBN 1-84176-657-7. Hobson, Chris. Vietnam Air Losses, United States Air Force, Navy and Marine Corps Fixed-Wing Aircraft Losses in Southeast Asia 1961–1973. (2001) Midland Publishing. ISBN 1-85780-115-6. McCarthy Jr., Donald J. MiG Killers, A Chronology of U.S. Air Victories in the Vietnam War 1965–1973. Specialty Press; 2009 ISBN 978-1-58007-136-9. Michel III, Marshall L. Clashes, Air Combat Over North Vietnam 1965–1972. Naval Institute Press; 1997. ISBN 978-1-59114-519-6. Toperczer, Istvan. MiG-17 and MiG-19 Units of the Vietnam War. Osprey Combat Aircraft #25, 2008 2nd ed. ISBN 978-1-84176-162-6. Wikimedia Commons has media related to M61 Vulcan. "Evolution of the M61 Vulcan Gatling Gun". Army. Archived from the original on 21 September 2008. .